When you feel unsettled and flighty, try this yogic breathing exercise that helps balance the right and left hemispheres of the brain. It’s often done in preparation for deep relaxation or meditation. Is the path you’re walking making your truly happy? 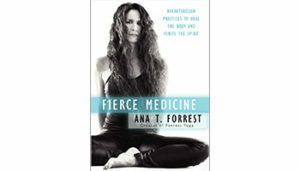 Ana Forrest, author of Fierce Medicine, reminds us that in order to live an authentic life and achieve our goals, it’s important to set your intent. September is the official National Yoga Month. To celebrate and inspire healthy living, we’re offering ebooks from renowned yoga teachers Ana Forrest & Donna Farhi for $2.99 each until September 16th! We’re almost to the end of the work week and chances are you’ve spent quite a bit of time in at your desk, in front of your computer. Close your office door and take a few minutes to practice a simple yoga pose with healthy mind, healthy body benefits.